Sounds cool to be a CEO? To wear a suit, go to meetings, and bark around business strategies to your board of directors? 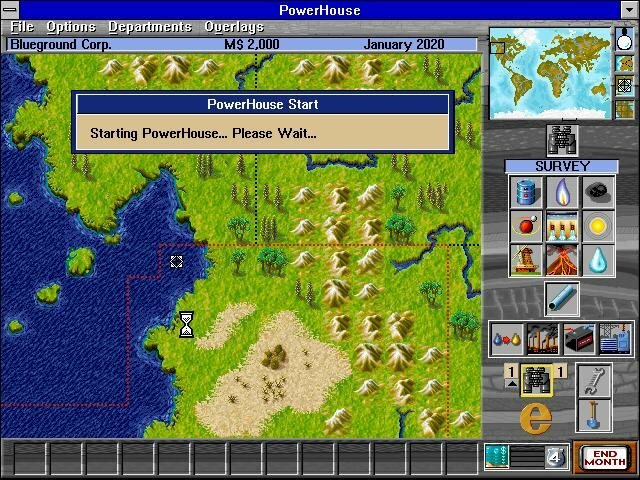 Well, Powerhouse gives you the reins of a corporation, a small territory to start it, and a populace hungry for electricity. What can you do with it? 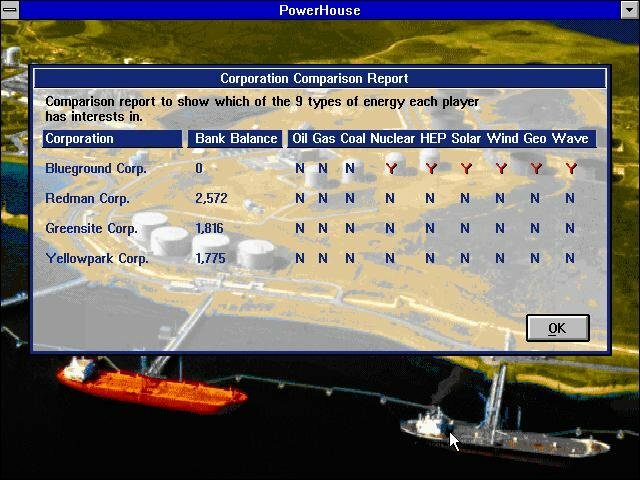 Will you invest in environmentally safe forms of power, or let your power plants pollute the region? 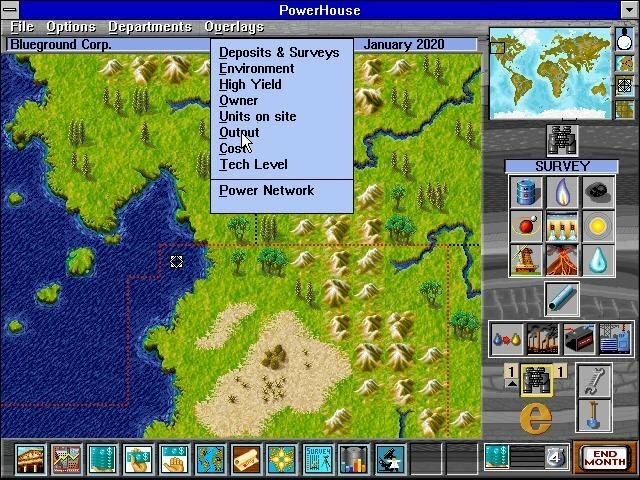 Will you hire researchers to come up with new and better forms of power and improve your plants? 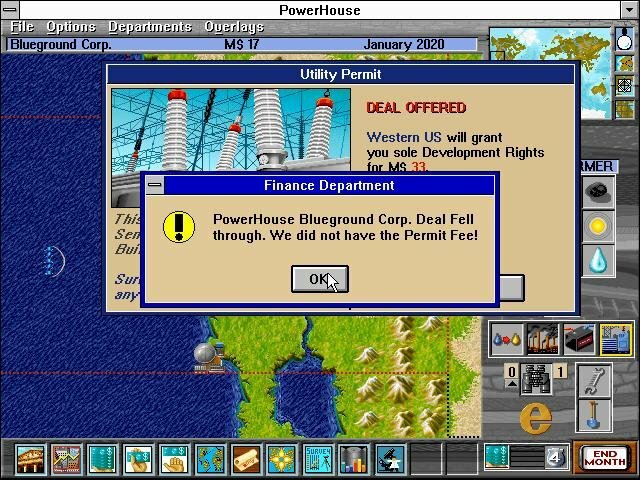 Does the new communist government in that little country you’re servicing want to convert all your power plants to state ownership? 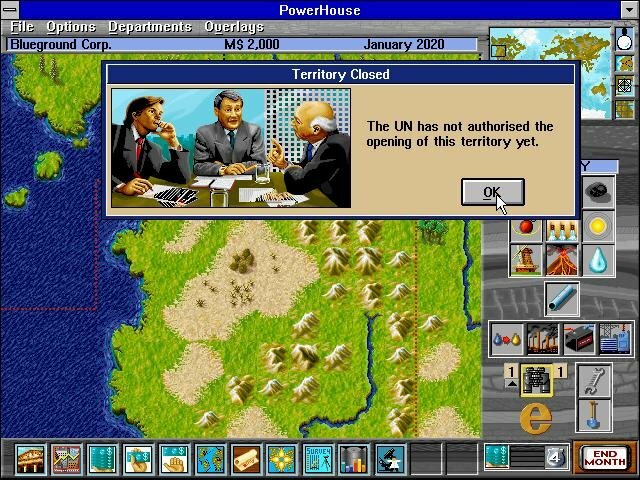 Maybe a little sabotage or industrial espionage will give you a bit of an edge over the competition. The premise is simple. 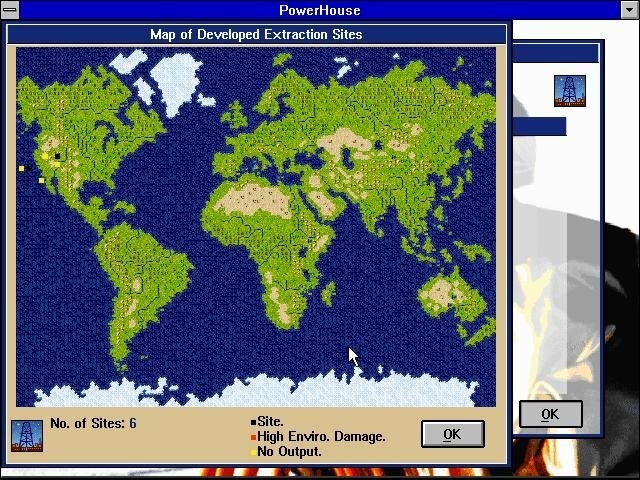 You and your three opponents start in a single territory and must meet that area’s energy needs. At the outset, you hire surveyors to chart the land and determine the most profitable forms of energy for each square of the territory. Is there gas there? Will it support a dam? How hard will it be to harness this energy? And what will be the environmental impact? All these questions are answered by each surveyor for a nine-square area. Once the best energy source is determined, you build it, start improving it, and start looking for more sources to exploit. 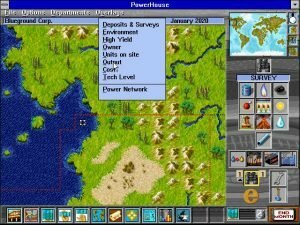 Powerhouse puts nine forms of power at the disposal of the user: coal, oil, gas, solar, nuclear, wind, wave, tidal, and geothermal [see sidebar]. Some are more profitable than others, some more environmentally sound, some cheaper to maintain or easier to exploit. This tends to fluctuate from site to site and government to government. Some coal is very deep and requires months to reach. Some governments are very intolerant of bad environmental impact, and will cause trouble for forms of energy that pollute or owners who don’t keep sites clean. Some forms of energy are good to build early because they’re cheap to build, produce a regular yield, and are environmentally safe. With solar, wind, and hydroelectric, you’re pretty sure of a continual — if smaller — yield in the early days of your company. 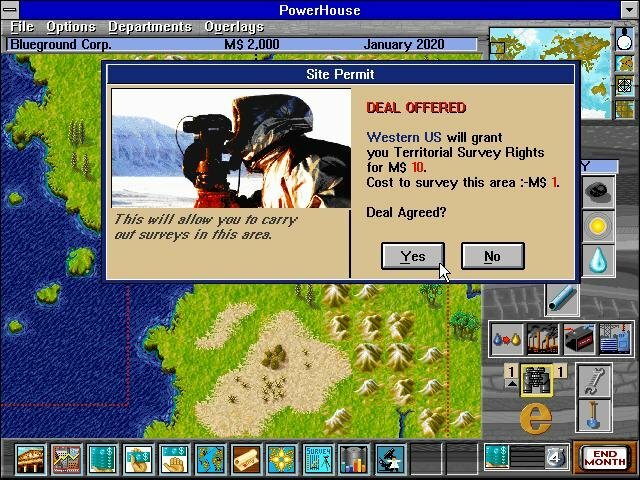 When you spend five or six months drilling for oil or waiting for that nuke to get online, they’ll supply some much-need capital and keep you afloat. 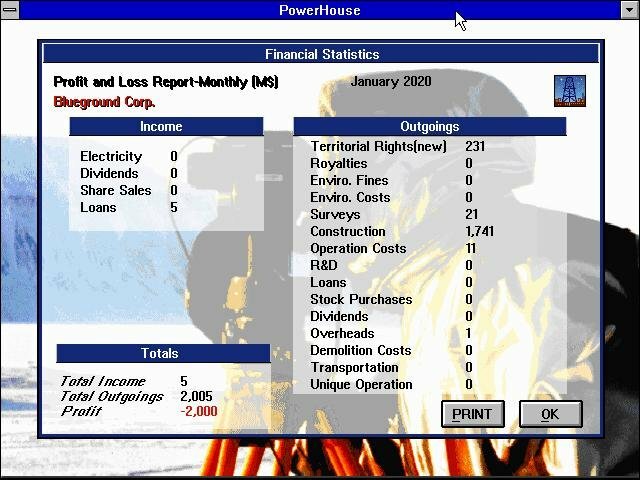 As with all Impressions titles, countless charts, graphics, and monthly reports track progress and failure. Every year or during emergencies there are small, and mostly useless, video clips to determine CEO of the year and other such nonsense. 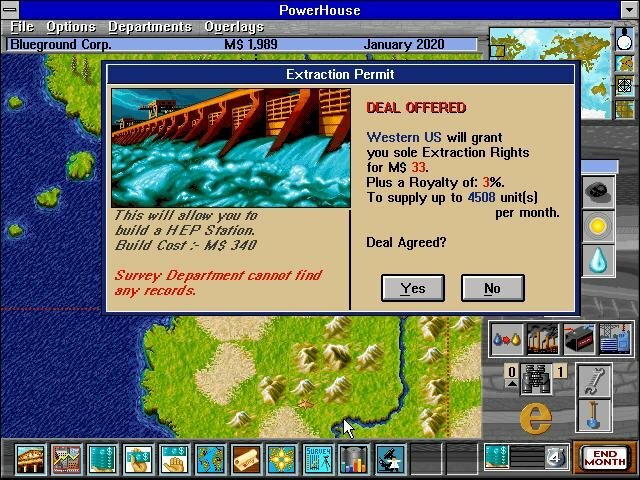 Players can buy and trade in stock, borrow money to expand, and, most interesting of all, conduct “unique operations.” These range from sabotage, espionage, and slander to bribing government officials, and add a nice twist to the game (a twist that was originally promised for, but left out of, Transport Tycoon). 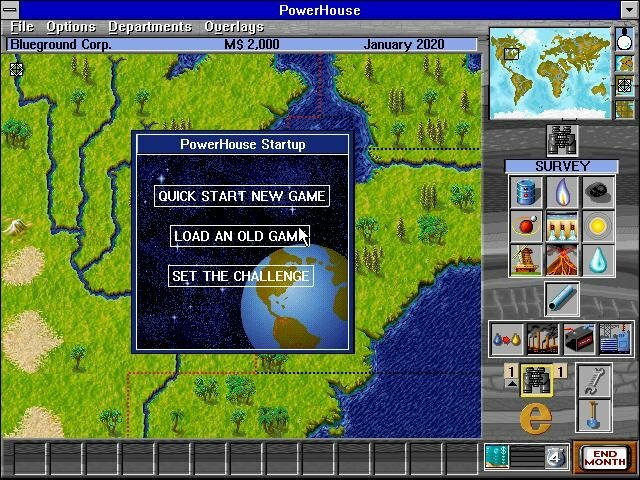 Using a Windows interface, Super-VGA graphics, and some multimedia tinsel, Powerhouse has created their most streamlined, attractive, and playable niche game up to that point. It’ll take a few passes through the manual to understand the elements of play, but that’s only because this is a complex subject and a multifaceted game.